The Milwaukee brace is an active corrective spinal orthosis. It consists of a neck ring with a throat mould and two occipital pads to avoid a high pressure in the neck. Other elements are a plastic pelvic girdle, aluminium uprights, leather L-shaped thoracic pads and metal bars in the front and in the back. A Milwaukee brace is used in the treatment of postural disorders like idiopathic scoliosis or Scheuerman disease. The brace is normally prescribed for children, with a postural disorder, who have not reached their growth spurt or who are in their fast growing period. It is not used for adults or adolescents already beyond their growth spurt, as it will have no effect. It is especially recommended in cases where there is fear of deterioration during the growth spurt of adolescents. If the spinal curve has a Cobb angle between 20° and 40°, it is an indication to use a brace. Under this Cobb angle interval, the curve of the patient stays under observation. Above this interval surgeons will intervene rather than wear a brace. The brace consists of a pelvic corset, thoracic pad, neck ring, and rib pressure pad. The pelvic corset fits snugly over the iliac crests, around the waist and curves upwards in front to support the abdomen. It is cut lower at the sides to avoid pressure on the costal margins. It also keeps the pelvis in a posterior tilt position, decreasing the lumbar lordosis (an excess in lumbar lordosis is often seen in scoliosis patients). The metal bars are attached to the leather pelvic corset to form a base from which one anterior and two posterior metal uprights pass upwards to a ring around the neck. The ring is inclined at 20 degrees to the horizontal. The uprights are adjustable to allow for growth. The throat mould is placed just under the chin. If it fits well, it does not touch the mandible. Its aim is to remind the patient to retract the chin and to keep the head posteriorly against the occipital pads. The action of the pelvic girdle and the throat mould together keeps the head centred over the pelvis. Rib rotation is corrected by a pressure pad located over the rib prominences. The pressure pad is fixed to a single, heavy, broad leather strap which is attached to the uprights at the desired level by stud fastenings. The leather strap is passed over the posterior bar on the convex side so that the pressure is applied directly from the lateral side. 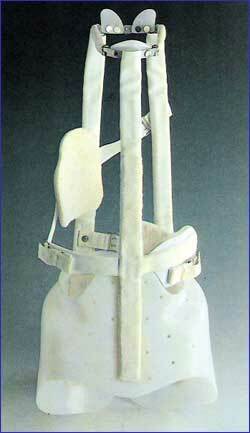 The Milwaukee brace is used for conservative treatment of postural disorders. Its aim is to keep the body upright and prevent progression of the curve while the patient is growing and awaiting possible need for operative intervention. It is recommended to wear the Milwaukee brace 23 hours a day. The one-hour that the child spends out of the brace should be spent doing exercises. Studies have proven that this protocol is effective for the conservative treatment of adolescent idiopathic scoliosis. It is important that the brace is checked and adjusted regularly while the child is growing and the curve correction progresses. The program stops when skeletal maturity is achieved and if the curve is under control. The process of stopping the brace program should be done gradually and followed carefully. If there is any sign the curve deteriorates the patient should wear the brace again as before. Activities and exercises are recommended and possible in the brace. Sports are also recommended, but the patient should avoid contact sports, where the brace can be harmful for the opponents. This protocol has been shown to have psychological and body image issues on the patients. Some patients wear their brace a lot less than is recommended: instead of 23 hours a day they wear it for 15 hours. Promotion of normal movement, activities and sports should be the focus of physiotherapy intervention. A holistic approach should be undertaken and not just focused on the management of scoliosis. Regular interventions with physiotherapists for exercise and posture retraining can have a positive psychological impact in patients with scoliosis. Regular physiotherapy has also been shown to reduce pain scores compared with home exercise programmes alone. Exercise and the use of bracing has had positive outcomes in regards to function, pain and reducing surgery rates. Specific exercises for the Milwaukee brace can be used however, they follow similar principle to the exercises above. Manual therapy can be used such as gentle mobilisations in conjunction with stabilisation exercises. There is however; no good evidence to support manual therapy as a stand alone conservative management of scoliosis. In the long term compared with surgical management quality of life for scoliosis sufferers is similar however, more pain has been reported with brace wearers. After treatment with the Milwaukee brace sufferers of scoliosis in adulthood had more issues with body image and emotional well-being than with pain or function (compared with a surgically managed group). Despite this, bracing (Milwaukee or others) is still a recommended conservative treatment of scoliosis. In conjunction with physiotherapy has been shown to reduce pain, improve function and reduce the Cobb angle of patients. ↑ 2.0 2.1 2.2 2.3 2.4 Maruyama T, Takeshita K, Kitagawa T. Milwaukee brace today. Disability and Rehabilitation: Assistive Technology. 2008 Jan 1;3(3):136-8. ↑ 4.0 4.1 4.2 4.3 4.4 4.5 4.6 4.7 4.8 4.9 Negrini S, Donzelli S, Aulisa AG, Czaprowski D, Schreiber S, de Mauroy JC, Diers H, Grivas TB, Knott P, Kotwicki T, Lebel A. 2016 SOSORT guidelines: orthopaedic and rehabilitation treatment of idiopathic scoliosis during growth. Scoliosis and spinal disorders. 2018 Dec;13(1):3. ↑ John D.M Stewart, Jeffrey P. Hallett, Traction and Orthopaedic Appliances; B.I.Churchill Livingstone New Delhi, Second Edition; Spinal Orthosis, Milwaukee brace; Page No.141. ↑ 7.0 7.1 Maruyama T, Takesita K, Kitagawa T, Nakao Y. Milwaukee brace. Physiotherapy theory and practice. 2011 Jan 1;27(1):43-6. ↑ 8.0 8.1 Misterska E, Głowacki J, Głowacki M, Okręt A. Long-term effects of conservative treatment of Milwaukee brace on body image and mental health of patients with idiopathic scoliosis. PloS one. 2018 Feb 23;13(2):e0193447. ↑ 9.0 9.1 Andersen MO, Christensen SB, Thomsen K. Outcome at 10 years after treatment for adolescent idiopathic scoliosis. Spine. 2006 Feb 1;31(3):350-4. ↑ de Mauroy JC, Lecante C, Barral F. " Brace Technology" Thematic Series-The Lyon approach to the conservative treatment of scoliosis. Scoliosis. 2011 Dec;6(1):4. ↑ Weiss HR, Negrini S, Hawes MC, Rigo M, Kotwicki T, Grivas TB, Maruyama T. Physical exercises in the treatment of idiopathic scoliosis at risk of brace treatment–SOSORT consensus paper 2005. Scoliosis. 2006 Dec;1(1):6. ↑ 12.0 12.1 Choi J, Kim HS, Kim GS, Lee H, Jeon HS, Chung KM. Posture management program based on theory of planned behavior for adolescents with mild idiopathic scoliosis. Asian nursing research. 2013 Sep 1;7(3):120-7. ↑ 13.0 13.1 Zapata KA, Wang-Price SS, Sucato DJ, Thompson M, Trudelle-Jackson E, Lovelace-Chandler V. Spinal stabilization exercise effectiveness for low back pain in adolescent idiopathic scoliosis: a randomized trial. Pediatric Physical Therapy. 2015;27(4):396-402. ↑ Negrini S, Grivas TB, Kotwicki T, Rigo M, Zaina F. Guidelines on" Standards of management of idiopathic scoliosis with corrective braces in everyday clinics and in clinical research": SOSORT Consensus 2008. Scoliosis. 2009 Dec;4(1):2. ↑ Maruyama T, Takeshita K, Kitagawa T. Side-shift exercise and hitch exercise. Studies in health technology and informatics. 2008;135:246-9. ↑ Morningstar MW, Woggon D, Lawrence G. Scoliosis treatment using a combination of manipulative and rehabilitative therapy: a retrospective case series. BMC Musculoskeletal Disorders. 2004 Dec;5(1):32. ↑ Romano M, Negrini S. Manual therapy as a conservative treatment for adolescent idiopathic scoliosis: a systematic review. Scoliosis. 2008 Dec;3(1):2.